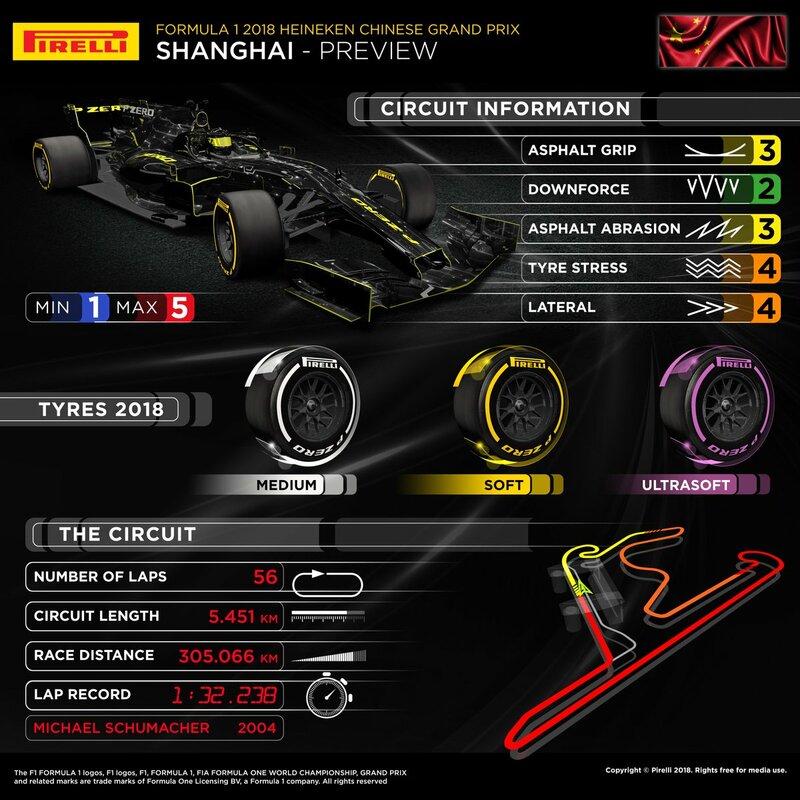 After the relatively balmy temperatures of Melbourne and Bahrain, the teams can expect somewhat cooler conditions in Shanghai this weekend. Friday's high will be around 20 Celsius, but this could well be accompanied by rain, which could throw a serious spanner into the team's practice programmes. Dry but cloudy is the outlook for Saturday, at around 17C, while Sunday should finally bring clear skies and sunshine in time for the race, with temperatures rising again slightly to around 18C. Last edited by UnlikeUday on Sat Apr 14, 2018 5:42 am, edited 3 times in total. I really like that they skipped a tire compound here. Should be interesting! Is that what they've done or is it just a gaffe on the picture and you're having a laugh? You've got me intrigued now dammit that they might have done something half interesting for a change. Pretty sure the super soft is between the soft and the ultra's so yes, it looks like they have skipped a compound. 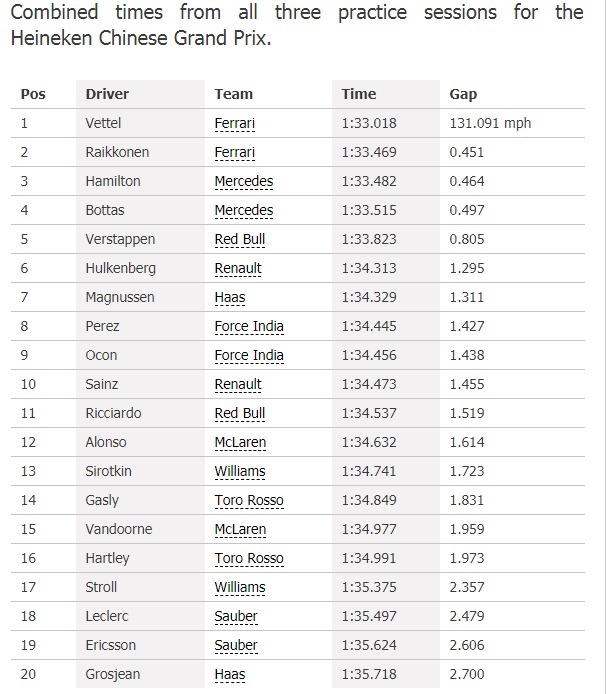 Mercedes won this race last year, Ferrari have had a great start this year but they also won Bahrain and Aus on merit last year so it’s debatable if the 2018 car is stronger or not. Mercedes should start doing Q2 on the harder tyre, its going to be THE strategy this year I feel. 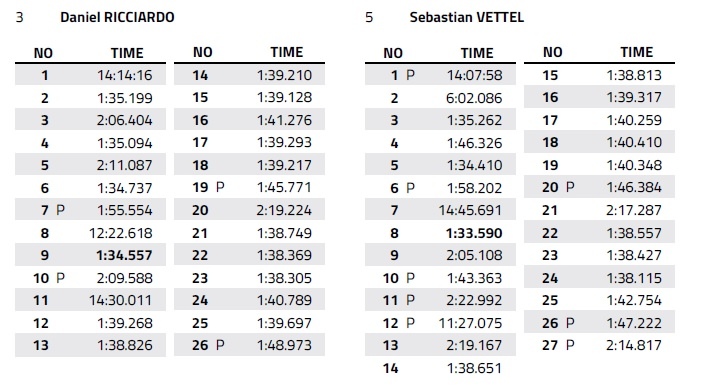 IIRC Ferrari could have won this race on strategy last year, had the safety car not come out on the pit straight giving all the drivers in front of Vettel a free pit-stop. 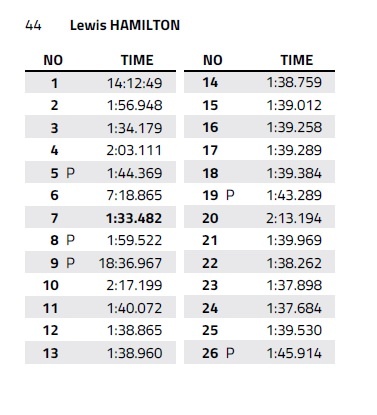 Also the pace between Vettel and Hamilton was pretty much identical after Vettel got back into second, but Hamilton could have been holding back I suppose. Well to be fair, they have done this a few times in the past already. As per 1 weather forecast for the race weekend, there are chances of light rain on Friday, heavier rain on Saturday & Sunday will be overcast / cloudy. 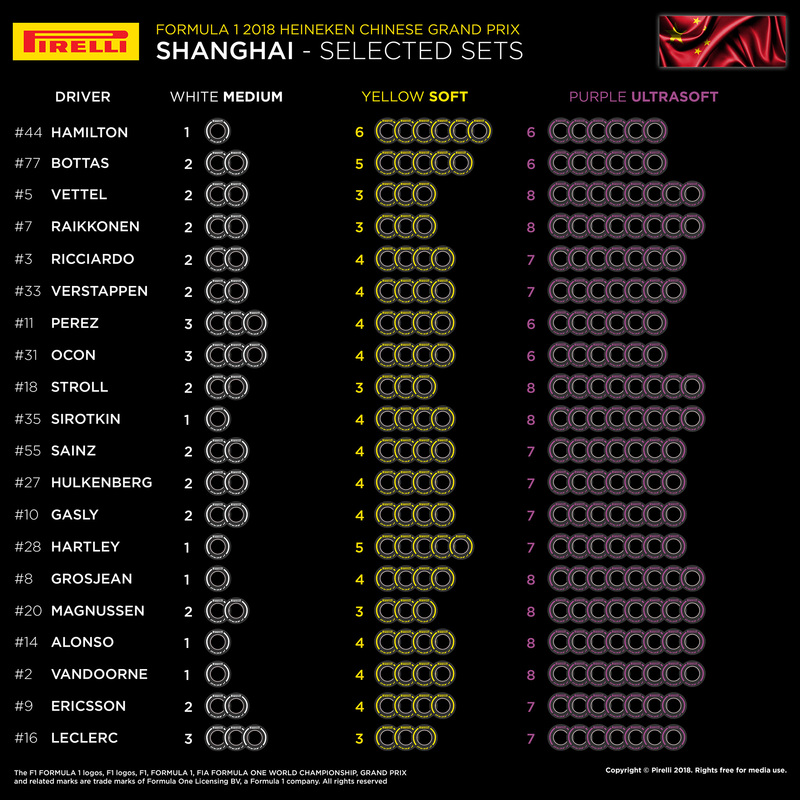 Cooler conditions will surely suit Mercedes & more so for Hamilton who has relished the Shanghai circuit in the past. Interesting to see that Mercedes have gone conservative, will that help or hinder them? Also will the top 3 teams feel comfortable in attempting to get through Q2 on softs with the double step in compound? Could be a race winning move if they can get away with it. 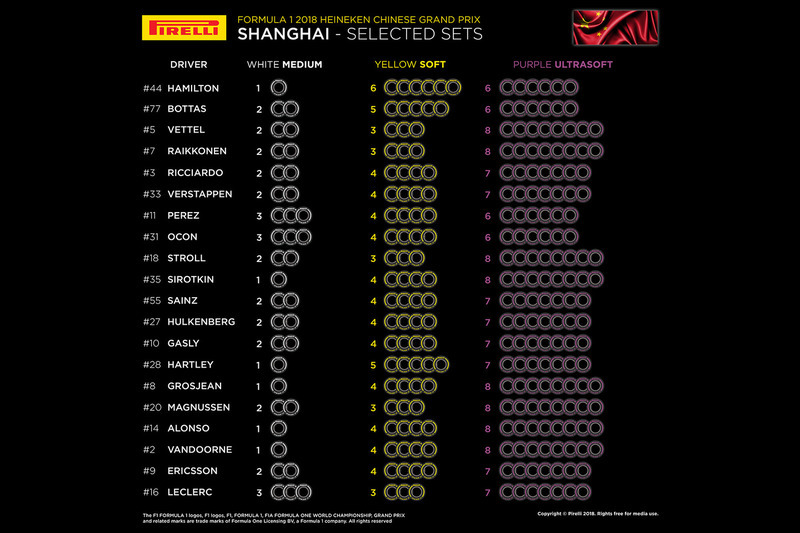 The tyre choices were made even before winter testing, going harder seems to be the way forward for Mercedes which we might see even more of when the choices are made for the next batch of races? Ferrari will take pole position because Mercedes can’t work the ultrasoft over one lap. But Mercedes will win the race because they will start on softs, the tyres they use in Q2. Ferrari will also struggle with fuel consumption. didnt hamilton get pole in australia with the ultrasoft tyres. and started the race with ultrasoft. I don't think the ultrasoft will last more than 10 laps here. opening pic in this thread! Actually I realised the answer half way through writing that. That strategy only really works in races that aren't one stop. Because if you start on the soft and its a one stop race, you will have a tyre advantage in the 2nd stint but usually thats not enough to be able to overtake on most tracks. 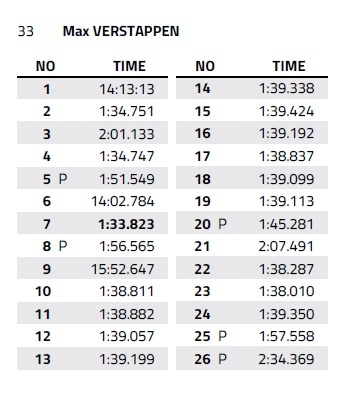 Hopefully more races are 2 stoppers, Bahrain was definitely a 2 stopper with the 1 stop much slower. 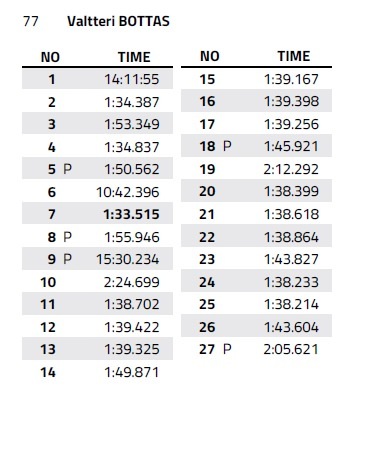 Only Fp1 but it looks like Merc is just going to breeze through this weekend, well in qualy anyway. I am still very wary of those redbulls on race day. Ferrari is predictably off the pace here. A must win for Hamilton. Looks like Max had another 150bhp boost. Good to see Force India finding some performance. Looks crazy tight at the top.... Kimi once again appears to be matching Vettel. 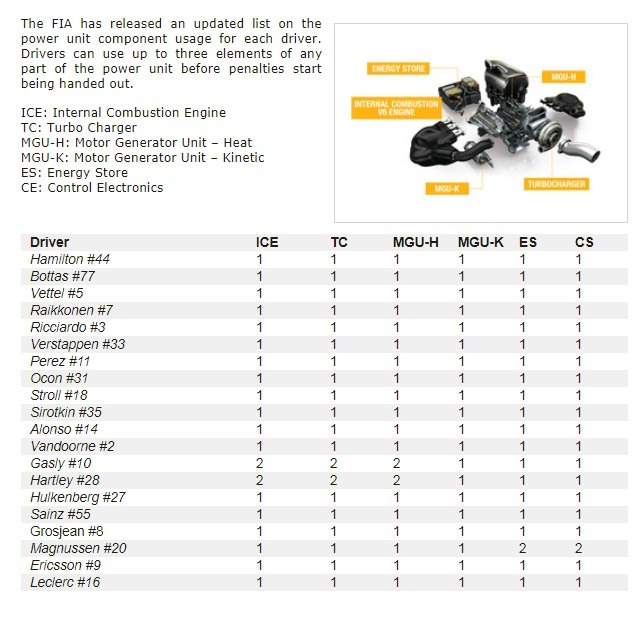 Renault plans to make another step when the second round of power units come on stream, with a major MGU-K upgrade among the items in the pipeline. "As far as hardware is concerned if we are sticking to our plan, it's for power unit number two, which is not coming for a while," he said. For the time being it's more energy related. "We'll have some more stuff coming from the ICE, and also with the fuel a bit later, depending on the teams, as we're not using the same fuel [supplier]." Stroll is looking abysmal again. Not even close to Sirotkin in both FP1 and FP2 and by far the slowest car. It seems close at the front and if it is more than 1 stop then any of the 3 teams can win. 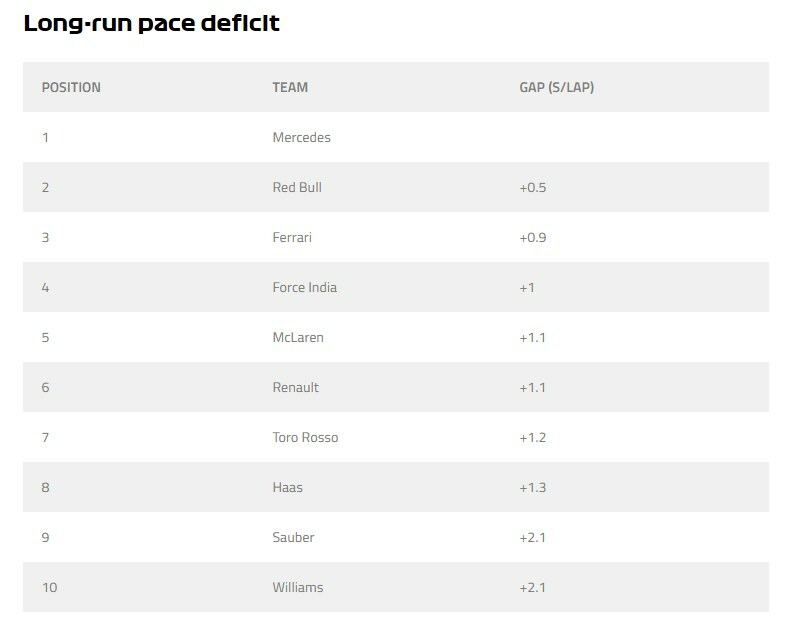 We are still yet to see this Red Bull race pace. Lewis made mistakes on his lap but Vettel said his "we have changes to make to find the time" and whenever he says that they tend to miraculously find time on the Saturday. So Hamilton or Vettel taking an easy pole wouldn't surprise me but it looks close thus far. 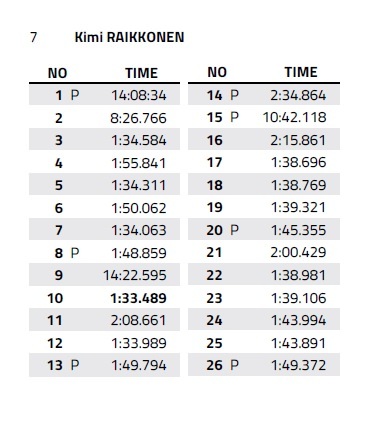 It seems that Kimi had quite a poor S3 and had to avoid one of the Saubers, which should easily have made up the 0.007s he fell short. Although having said that, Mercedes are normally able to find that little bit extra in qualifying, too. Ok, I did not see that. Kimi is having a decent year thus far. He could actually be in the WDC lead if things just banned out slightly differently. But on the saturdays, even when Kimi is strong, Vettel tends to have that last 0.1 to pull out his pocket at the last moment. This season, I wouldn't outright discount Kimi over 1 lap but that just seems to be the case. Kimi's season so far isn't going badly in that he isn't being humiliated after two races. In Melbourne he seemed to have the edge over Vettel, something which reversed in Bahrain. It's very early to be seeing this year as a big turnaround for Raikkonen. I'd love to see him have a great year and best Vettel, but one shouldn't get ahead of one's self. I stopped simply believing in "things panning out differently" long before Monaco last year. Melbourne this year was a very timely reminder not to start believing any time soon. I understand commentators having to put that slant on it, to make the business appear like a sport, though. But, if Kimi is happy at Ferrari, then I'm happy for him! Ferrari sandbagging or in need of some big set up tweaks, no chance they are that close to the upper midfield. Heavy rain lashed the circuit overnight. Track would be green & is a bit damp now. It's crazy windy. Ricciardo's car suffering from Turbo failure. Bad luck keeps following the honey badger.